For the Finest Flags and Ceremonial Equipment. We ship to FPO/APO worldwide. Welcome to our store. If you are looking for custom made guidons, flags, Official Navy & Coast Guard Ship Award & Signal Pennants Battle Streamers & accessories for your organization then you have come to the right place. Serving the San Diego, North County California area as well as U.S and worldwide via our website. 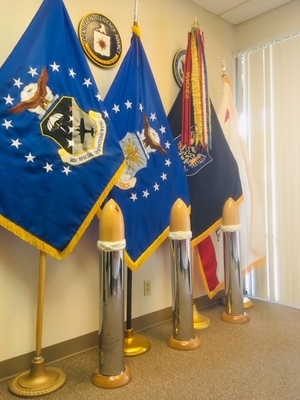 At Guidons and More, we specialize in custom military guidons and ceremonial and organizational flags that are made to official heraldic specifications. We can supply your organization with all your uniform accessories. We are an authorized vendor of the complete line of Vanguard uniform accessories such as medals, patches, insignia, and emblematics. Allow us to quote your uniform and ceremonial product needs. Our Production Team has over 20 years experience in making custom Flags and Guidons and will put thier experience to work for you. We use the best materials available for your project and your satisfaction is our top priority. Choose from Army Guidons, USMC Guidons, USAF, Navy, and Coast Guard Guidons. Available is several sizes and framable for display or as gifts. We offer customized guidon framing and matting or if you prefer, you can purchase one of our frames and mount your guidon. G-Spec Items! We carry genuine government specified (G-Spec) Flags, Official Battle Streamers, Pennants and Honor & Color Guard equipment. This product line is made of items specifically made to exact government specifications and are currently being supplied to the U.S government agencies. Government Agency Flags; We carry an ever growing selection of US Government Agency Flags for the Department Of Homeland Security, Border Patrol flags, FBI Flags, Department Of Forestry, Dept Of Transportation Flags, FAA flags and more. SHIPPING- We Ship Fast! For stock items, we ship within 24 hours of payment. UPS is our primary shipper but we can also ship U.S. Postal service. Please note that if you select this shipping option, shipping costs will be added to your order after we receive it. You will be notified of your final total before your order is processed. TAXES- California Customers- Effective January 2017, We are required to charge 7.75% sales tax on orders placed from our location in California. Government Purchase card Holders- No sales taxes will be charged on your orders. Once we verify your purchase card number, we will remove any sales taxes charged when ordering online. We ship primarily within the USA,& Canada. APO and FPO's are no problem. We back up our stock products with a money back guarantee. No hassles, no delay. Please note custom items are non- refundable as we cannot resell them in most cases. A 15% restocking fee will apply on pre-approved returns. We use secure payment methods. PayPal is our preferred method of payment due to thier very secure website. It is an easy, yet very secure way to pay. We cannot see any payment transaction information. We accept VISA/Master Card/Discover/AMEX, US Government Purchase orders as well as CAL-Card and Government credit cards. All others, please call us. Shopping is convenient; shop from anywhere, at anytime, our online store is always open and we are easy to get a hold of. We also carry Guidon Poles and Accessories such as guidon pole floor stands, guidon storage cases, ferrules, and much more.